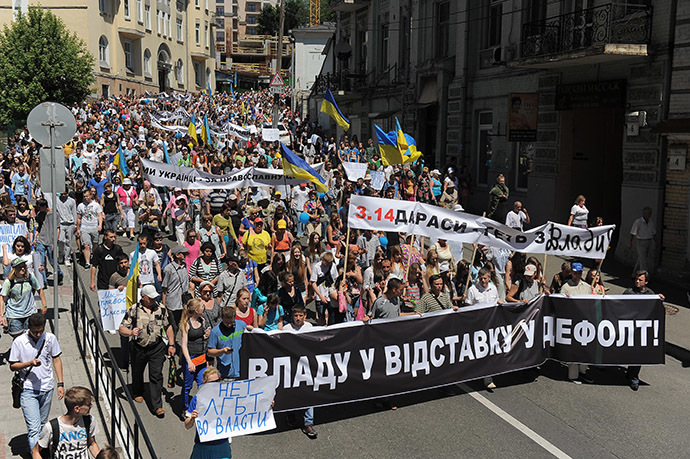 A massive march took place in the streets of Kiev to protest against the policies of the current Ukrainian government, calling for its resignation and economic reforms. According to TASS news agency, up to 3,000 people took to the streets in Kiev on Saturday to protest against lack of reform and economic instability. The people carried placards reading “We are hungry,” “Raise pensions” as well as some anti-LGBT slogans as they marched along Khreshchatyk Street to Independence square (Maidan Nezalezhnosty) in central Kiev. Others called for the current administration to be removed and President Petro Poroshenko impeached, saying his government was unable to handle the problems facing the country. Protesters demanded a raise in social welfare payments and an end to the unrest in eastern Ukraine. Reinforced police patrols ensured public order during the march. Meanwhile, on Friday a Gay Pride march also took place in central Kiev. However, it ended very quickly after attacks by far right radicals. Members of the Right Sector nationalist group hurled smoke bombs and stones at the demonstrators. Five policemen were injured, one seriously, and about 30 attackers were arrested, according to local media reports. Previous to the event, Right Sector spokesman Artem Skoropadsky threatened the LGBT activists saying “there will be thousands of us” to counter the march, the Kyiv Post reported on Friday. I just posted links to the recent George Soros letters in the Ukraine thread guys.